Transfer calls were Saturday, and I'm staying here until May. 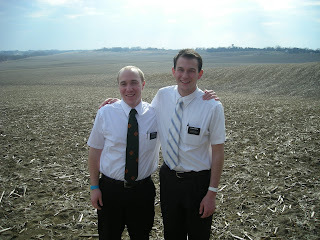 But Elder Eldredge is training again! 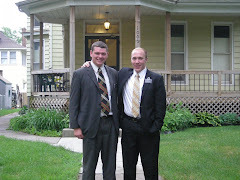 I'm going to have a brother, Elder Wilson has a uncle! It's going to be so cool, Elder Eldredge it still in the zone so I'm going to spoil my new brother so much. Ill give him a tie and buy his lunch and call him every night...its going to be awesome. I will get some family pictures. I attached some pictures from the week. The first one is district meeting in Newton. 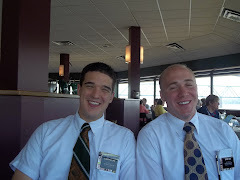 Elder Wengert is going home and it was his last district meeting. 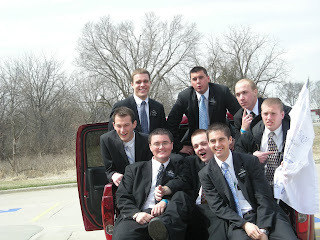 He is the one in the back, in the middle with the dark hair. 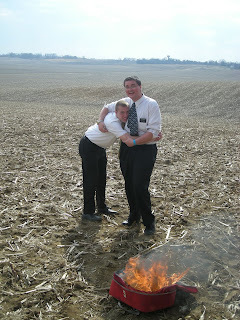 Some of the other pictures in the corn field are of Elder Bennett burning a white shirt, it was his one year mark. 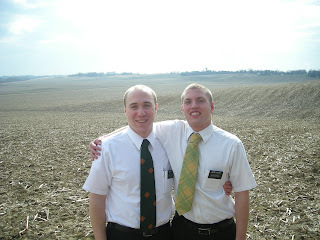 Elder Taylor is the one hugging him and then Elder Wengert steps in. 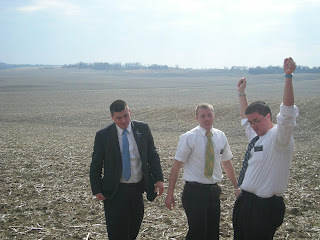 Then pictures of Elder Taylor and Elder Perfili and I in a picture perfect scene with the back drop of Iowa. I name it, "What to take home from Iowa". 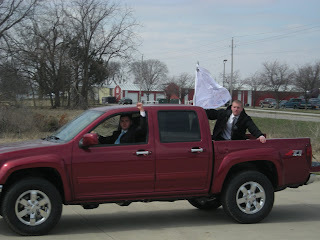 The last picture is Elder Taylor and Elder Wengert in their new car with the zone flag. They drove around waving the flag all the way to lunch. I wanted to tell you about the part-member family that we have been working with. We had a lesson before General Conference on Saturday. We taught the Savior's earthly ministry, but with the game, Don't Break the Ice. If you don't know what it is, it's very fun and only $7 at Target. We wrote Jesus Christ on all four corners and wrote the 12 apostles names, the ancient apostles from the New Testament. Then the first principles and ordinances of the gospel, Faith, Repentance and Baptism, receiving the Holy Ghost on some of the blocks. And on the remainder we wrote revelation from God and Priesthood authority. In the middle of all these block we made a clay church building to represent the church that Christ had established. We taught about the earthly ministry and the apostasy and took away blocks until the church that Christ established fell. It was a great visual to use to show the apostasy. We shared only the beginning part of the restoration due to time. We asked her if she understood what we were teaching and any questions or concerns that she had. She understood it clearly for the first time and started to say that she doesn't show emotion or affection to people, then stopped and started crying and thanked us. 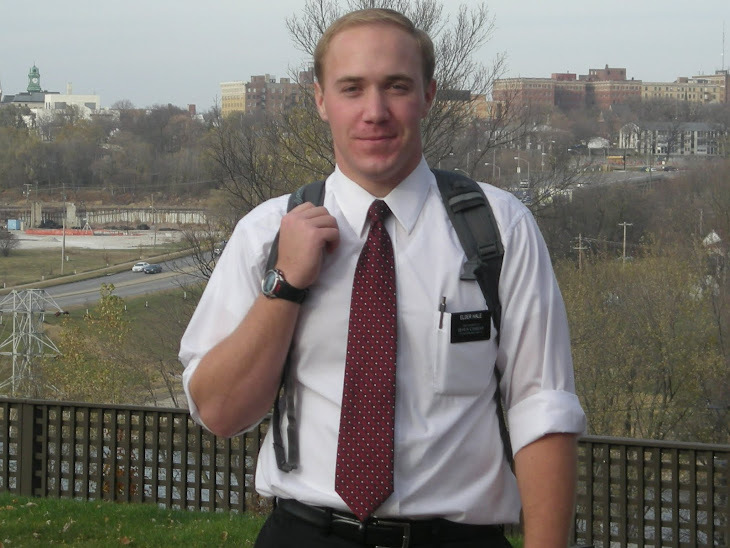 The new way that the church is doing missionary work is so effective at helping us as missionaries connect with our investigators, it's astounding. I have realized that a crucial part of conversion is building relationships with people, not to say that the Spirit is not converting, but to create a environment to invite the Spirit into a lesson leans heavily if the person trusts you and is comfortable. You must warm them before you warn them. And I think we have created that with this sister. We have also had miracles fall into our laps this week. Three people have asked us to be baptized. We are working with another part-member family. We went over there for lunch last week and before we shared a spiritual thought, Sister B (a non-member) was showing pictures of the Kansas City temple being built, then she said to us, "...that is the temple we are going to be sealed in." I just gave her a weird look and started talk to her about the church. Then she said that she feels that it is time for her to be baptized. She was taught 8 or 9 years ago by missionaries, but was discontinued. So yesterday we committed her to baptism on the April 30th and she accepted. Oh man so cool. There was a part-member family that moved into our ward last week, a sister with a 12 year old son. When she moved here, she called the bishop and asked for home and visiting teachers, a priesthood blessing, and visits from the missionaries. A miracle. The son keeps asking us to be baptized and we have had one lesson with her at this point. But Friday we are going to commit her and her son to baptism for Mother's Day. She is such a sweet lady. God has blessed us. Mom, I need to tell you that I have a Grandma out here making sure we are fed. Her name is Sister L, but I call her Grandma L. We see her every week to help her get active and get to the temple to do her husband's work. She wanted me to tell you that, "..someone out here is feeding your baby boy." I love sister L so much. P.S. Melanie you look very grown up in the pictures mom sent me.